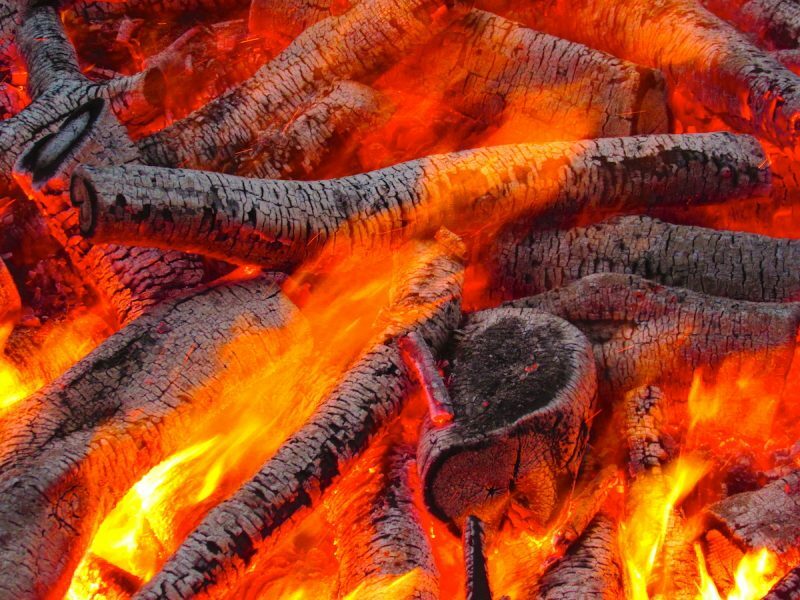 As wood burners have increased in popularity their reputation has grown in controversy. Apparently more and more people are installing them in urban and suburban areas as a way of reducing their heating bills. But they are also creating a clean air issue, something we are lucky enough not to have to deal with here at Ard Daraich. What we do know is that they create an immediate atmosphere of cosiness and comfort. Long before it became fashionable to create an atmosphere of Hygge we decided that wood burners would be central to our modernisation of Ard Daraich. We were persuaded by our architect not to rely on wood heat alone and as we have got older we are grateful to her. However, the wood burners are central to both sitting rooms and to the creation of a sense of home and welcome that we work hard to achieve. January is a good month to think about the work involved. 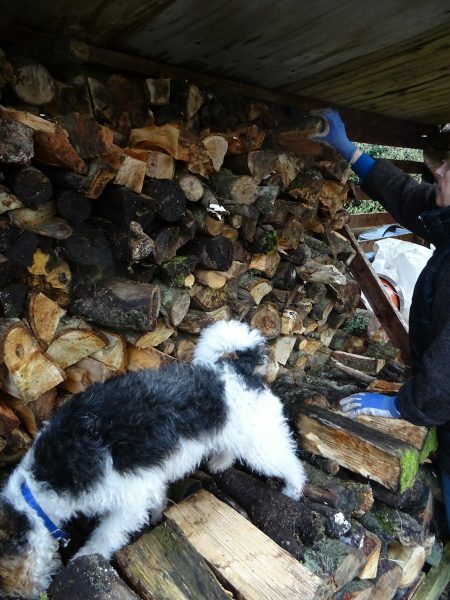 There is no one local running a firewood business and so we collect and chop our own. We are lucky enough that the local estate has a lot of over mature trees and after every gale there are tree fatalities. We hope we serve a useful function by asking if we can clear up the odd tree and leaving the twigs in piles for wildlife. 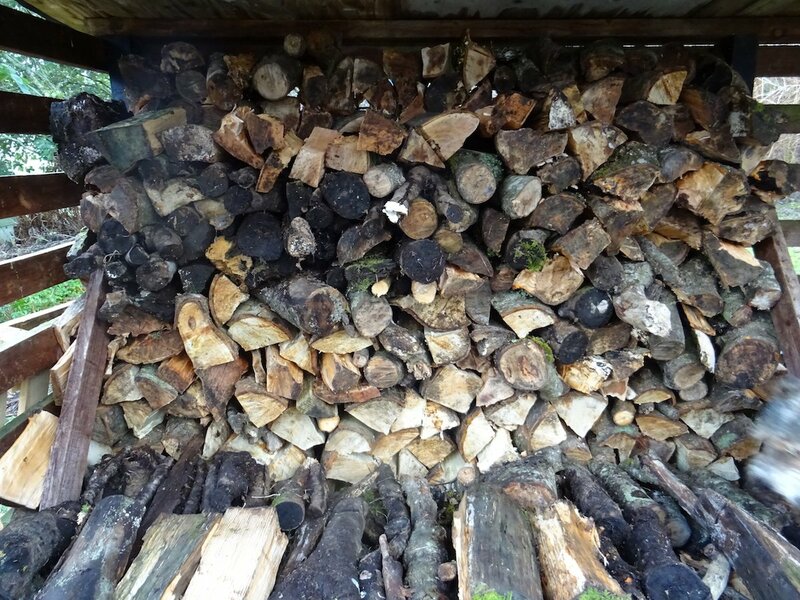 In the garden we have four large bins, covered and with slatted sides and our job this month is to chop and stack the logs we have collected for the sun and wind to dry them over the summer. We try and work a year ahead but this year I think we have slipped behind and may only manage nine months of drying time. 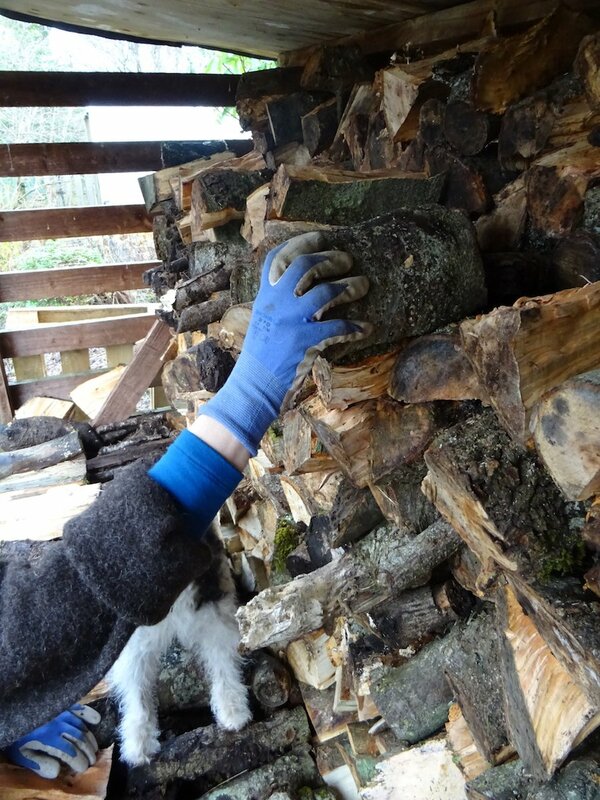 With very high levels of humidity it is important that the logs are as dry as possible. 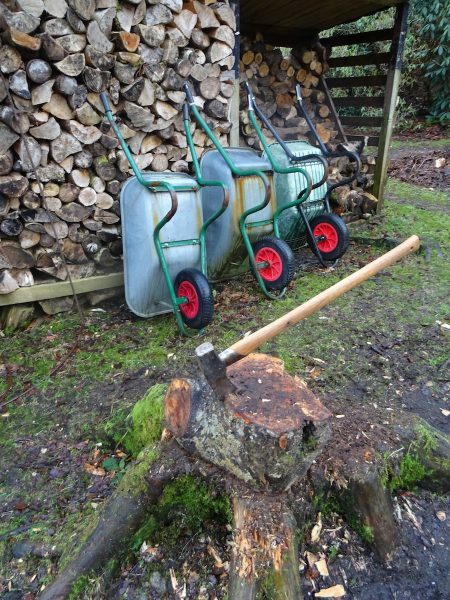 Poised for action - a fleet of wheelbarrows and the old stump and axe ready for log splitting.